a review of: RAHC Guide by noted Author James Kavanaugh Jr. The RAHC Guide is written by noted Author James Kavanaugh Jr. which you may know from the excellent What’s On Joe Mind podcast. It’s obvious this work is a labor of love. it covers an era of figures often looked down upon in a thorough manner. This is a guide for every figure and vehicle released from 1997 to 2007 and details their parts, what the came with, variants, and some trivia information. It isn’t a price guide, but it doesn’t need to be. Despite books like this including price guides, toy prices fluctuate enough that they can only be close to accurate briefly, and with this particular set of toys, sadly most of them are not as desired as the classic 12″ or ARAH figures, or even the more recent 25th to current style figures. Jump into the article for the full review. It may seem strange to start off a review with the cover, but i couldn’t help it. Both front and back are excellent dio pieces, and display much off the characters these figures represent, as well as the affection and attention the author has for them. 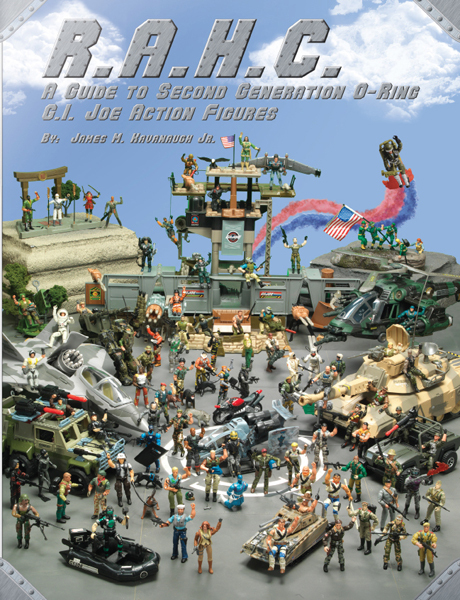 ON the front cover we see some of the 013 (original A Real American Hero G.I.Joe team members)rising the American flag, the Arashakage ninjas set aside, a hidden Zartan and a captured CC which could relate the “CC” in the back cover. On the back cover that focus on Cobra you can notice several neat things. Grunt and shipwreck are present in their Spytroops disguises, Rowdy Roddy piper is instructing an Iron Grenider to do push ups, Torch is lighting Gnawghyde’s warthog on fire!, Overlord and Venomious Max are fighting under the watchful eye of Mindbender and Serpentor. Perhaps another attempt to climb the ranks is going on? Slice and Slash are fist bumping similar to their silly behavior in VVV movie, and it’s hard to miss the dread heads in a congo line! As you can see their is a detailed “How-To” with this guard. The guide is incredibly thorough so this “How-To” helps keep everything straight. Because of this, you can simply browse the pictures, or enjoy a deeper second layer with some of the information. This enhances re-reading, and not just a second glance. James goes beyond coverage of retail released Joes and also covers mail-aways and exclusives including those produced by the G.I.Joe collector’s club. Most of these pieces are not in my collection and it was great to see them here, and in grouped in pages so that i could see a whole team in a glance. The information with the figures includes their wave, alignment, variations, repacks of the figure and more. Although my major focus is the figures, the book also covers vehicles in depth as well. Giving them the same detailed approach. James connects the driver to the vehicle by including the driver in the regular list of action figures for the year, and afterwords including a vehicle with a small head-shot of the driver. I was also pleasantly surprised to see surprises like the Action Pack footlocker included and detailed because it came with a repack of Due and CC in the JVC era, this shows that James didn’t miss anything. Accessories also covered. I hate to admit this but i had either forgotten or never knew that VVV (Valor Vs. Venom) Cobra Commander’s staff broke into two pieces, and that was one of my favorite accessories of the era. The last portion of the book is a section focusing entirely on these accessories. 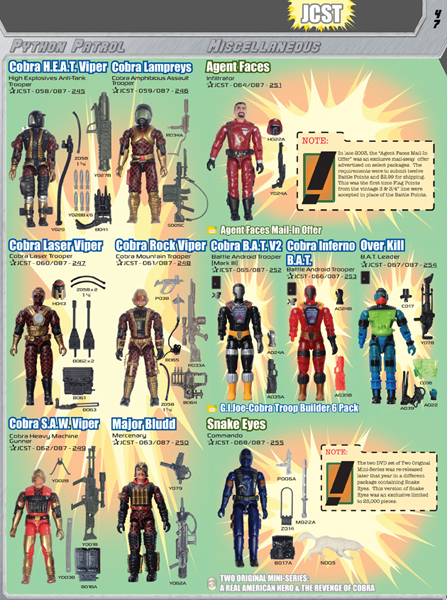 This era of G.I.Joe has a special nostalgia for me. I was getting out of high school as it released, and i thought well past the stage of grabbing toys. but as I saw the new sculpt toys randomly one day, I couldn’t help but get fascinated at some of the redesigns, especially CC’s mask and the addition f red to stormshadows colors. It sparked interested and before I knew it, i was a collector. for the first time my set of Joes and cobras were dependent on just gifts or chance, but I could order complete sets, army build without being told “you already have one of those.” and many of the designs were just the toys i had as a kid, they had a modern twist on them, some new characters as well, that sparked my imagination in a whole new way. Until POC hit this was the time I enjoyed Joe the most because as I kid i rarely had the figs i wanted most, including no snake-eyes, Scarlet etc. It also coincided with new comics, and being able to revisit the old ones, which i had barely read a few issues before. I’ve also met James, and he is a cool guy, even if he is rather infamous from some of the recounted Joe con tells on What’s on Joe mind. I enjoying supporting fellow collectors and fans, and this is a good way to do so, while getting something cool in return. I strongly recommend if you enjoyed this era of Joe, are serious Joe Collector, or in the business of selling toys you pick up this book! If your coming to Joecon this weekend, I know he will be there. To find out more information, or more importantly to purchase the book CLICK HERE to head to the noted author’s site. Additional preview pics are available on the site as well. 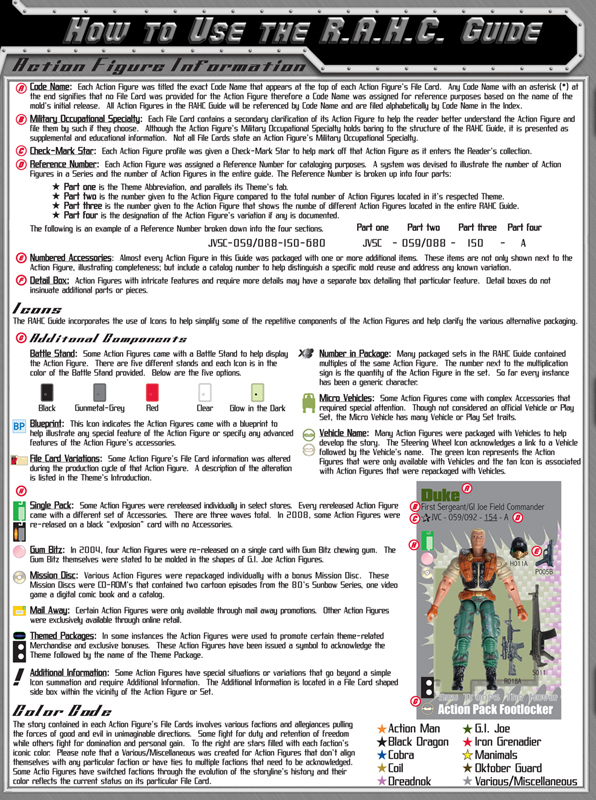 This entry was posted in G.I.Joe, reviews and tagged Arashakage, book, book review, club, Cobra, con, exclusive, G.I.Joe, joe book review, joe review, jvc, review, spytroops, vvv by servant sears. Bookmark the permalink.